There are over 48,000 people aged over 65 years in Plymouth, and over 35% of these live alone. Many older people struggle with health and mobility issues and manage on limited incomes, so when there is a cold snap people may struggle to keep themselves warm and ensure they have enough essential basic supplies. 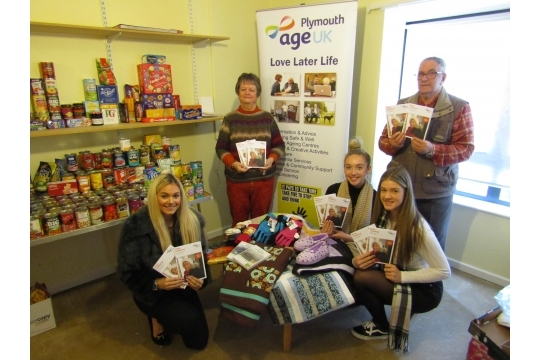 Age UK Plymouth with your support will be able to help those most in need this winter. All monies raised will be used to provide vital winter essentials such as a basic food pack, thermal clothing, blankets, hats, scarves, gloves etc and the opportunity to enjoy a hot meal and companionship at one of our centres in Plymouth. Older people who may struggle in cold weather will have peace of mind knowing they are able to keep themselves warm and well when the temperature drops. We are encouraging friends and neighbours to support our appeal to make sure that elderly neighbours and friends are managing during the winter months. Five minutes is all that it takes to check all is OK with an older person near you. We would like to thank Jaqui for her help with the attendance allowance form. Our claim was successful thank you. We are delighted to have the support of Complete Business Solutions who have generously donated £400 to launch our campaign appeal. Please share this page with friends, family members and colleagues and consider how you can help older people in your own community stay warm and well this winter.